Unsurprisingly I, like most other ork-fans, rushed down to my local game provider / plastics pusher this weekend and snatched up a copy of the new Codex: Orks. Well designed - the layout is beautiful. Fresh and modernized, while still unmistakably orky in style. Well written - staying true to the background while expanding it a bit. I also like how they toned down the pseudo science bits of ork/fungal DNA and leave the nuts and bolts of orkoid anatomy and inherited knowledge a bit more mysterious. 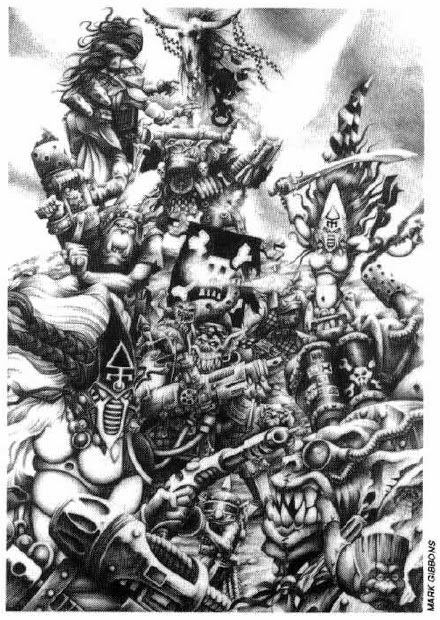 They´re portrayed as a bit too simplistic and bloodthirsty for my taste though - back in the days of Waaagh the Orks, ´Ere we Go and Freebooterz when I discovered the 40k universe they weren´t just bloodthirsty killing machines - there was always a philosophical streak to them. They loved war - but focus lay on the spectacle of warfare, the exhilarating adventure of fighting and genarally causing mayhem, rather than being into it for the sake of slaughtering people. There´s a difference between liking a"good scrap" and liking killing. Well designed rules as far as I can tell - I´m not rules nut. Great new minis - the orks are some of best designed ranges out there, oozing with character and highly customizable. The illustrations however, were a big letdown. There´s very few of them to begin with and the quality of the few scattered pieces of art is quite frankly depressing (with a few exceptions - mainly old Boyd and Smith pieces from earlier editions). 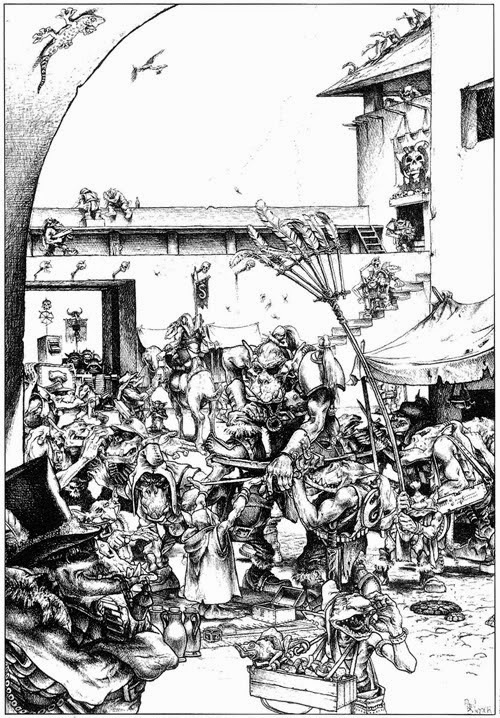 But instead of whining about it I´d like to take this moment to celebrate the fabulous ork illustrations that GWs products have featured historically - illustrations by the likes of Paul Bonner and Adrian Smith that had a huge inpact on me as a young whelp (which eventually led to me choosing a career as an illustrator myself). Images that tell stories - instead of just showing a bunch of bellowing monsters with explosions in the background they often focus on ork life outside (or just to the side) of the theatre of war. Images bursting at the seams with character and that special wry sense of humour that have always made the Orkoids so dear to me. 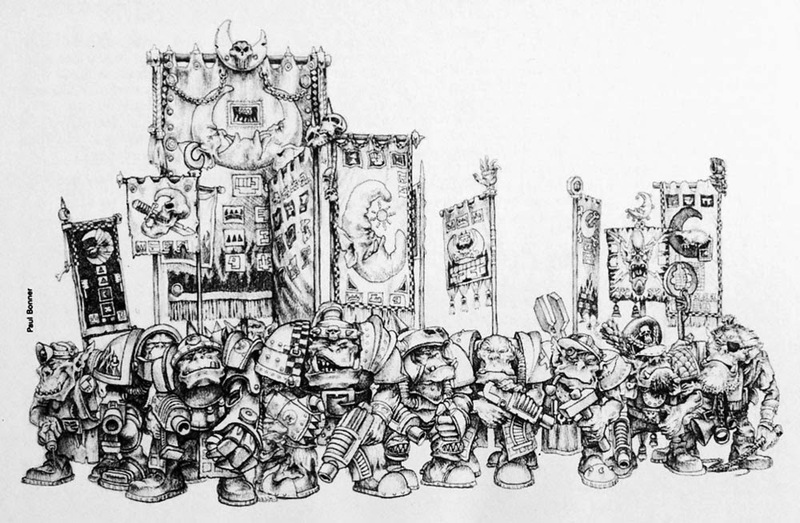 I do have to stress that I´m not saying that everything was better back in the rogue trader era. 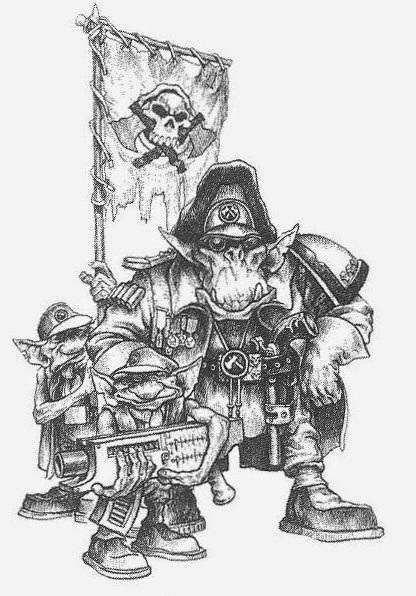 As loveable as the old Kev Adams orks were, the new range of Brian Nelson-styled minis are even better and these days we have stuff like stompas, fightas and gorkanauts one only could dream about in the old days. It´s just the great art and some nuances in the background I miss. Ded ´ard if you ask me. Coming up - more freebooterz! Waaargh the orks remains th ebest book ever written about orks. 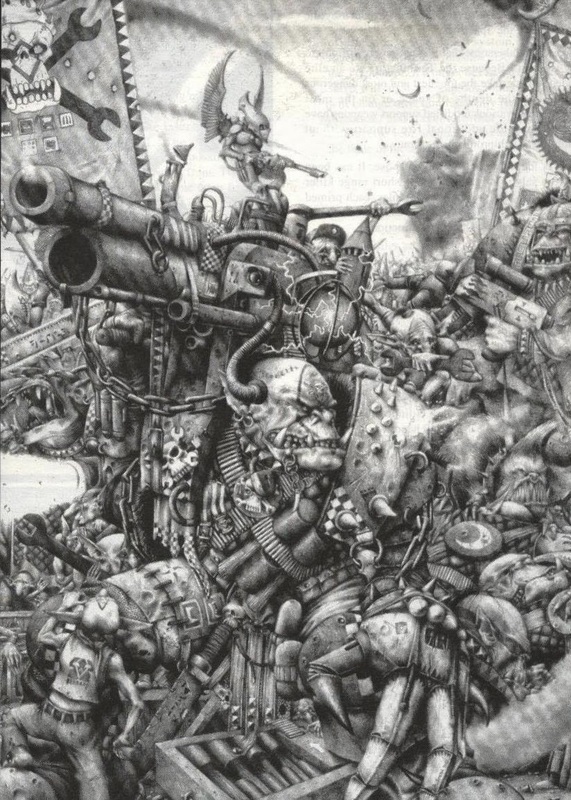 It is one book talking exclusively of their background and there is not a line of rule in it.Pure fluff just to tell you orks actually have a very intersting psyché which is (as you said it well) not about slaughter but about a love of adventure. I love the way they were cheerful and childish in those books. 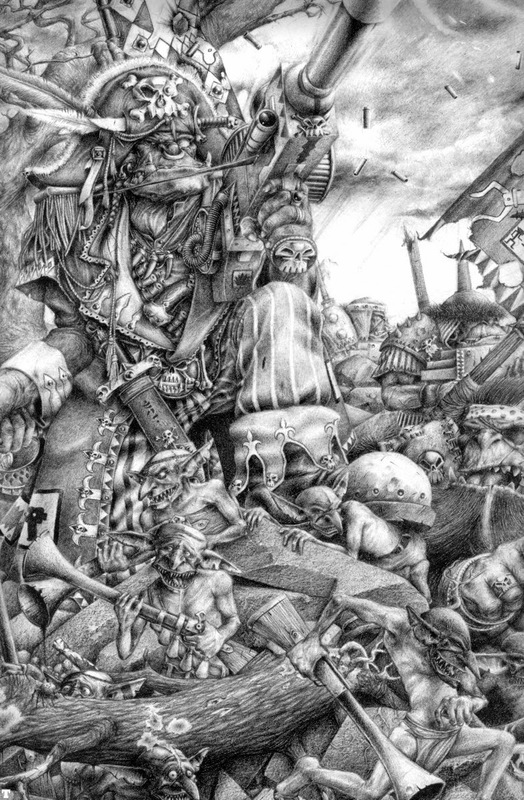 Adrian Smith has succeeded in depicting every race he drew. His Eldars , his tyrannids, his chaos, his orks, all of theml have their own identity and all of them fit perfectly their nature. Bonner's, Tappin's and others illustration have become legnedary now. That's a good path on memory lane. Recent orks don't really do it for me, weapons are far too big for my taste but that's just one opinion amongst others. 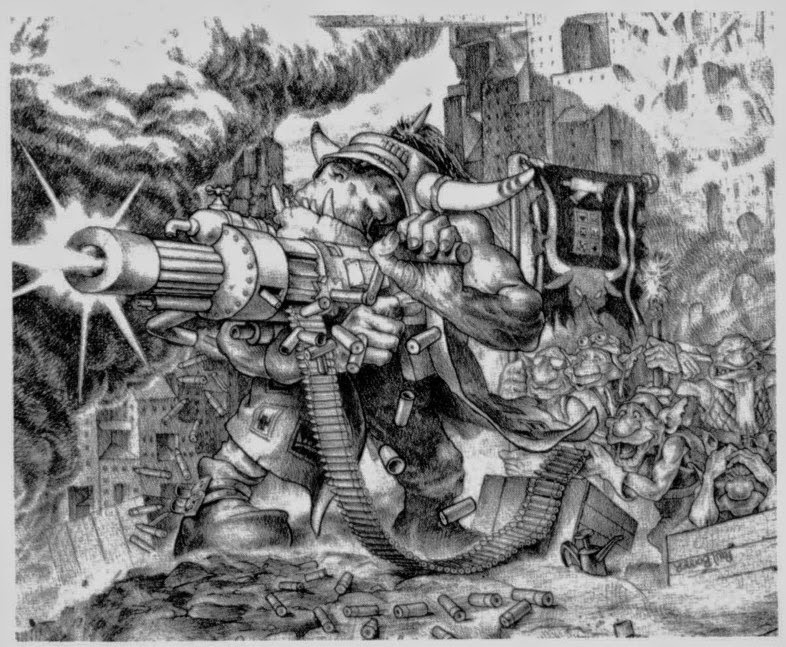 Early Smith is amazing - the kustom gun mek above os one of favourite GW illustrations ever. 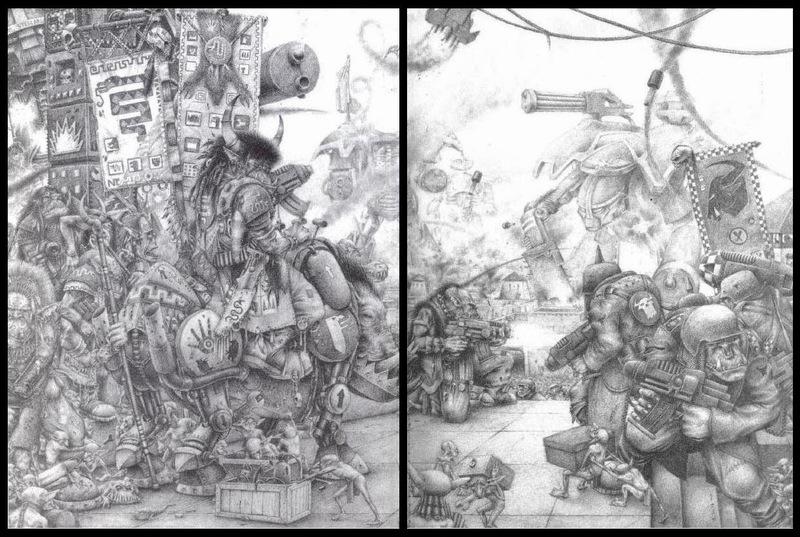 Paul Bonner's Squats, Orks and IG illustrations from the early 90's remain my all time fav' GW art ever. I'm also not a fan of the character-lacking current version of Orks. Too generic imo. I've noticed with quite a few of the recent codex a shift towards more of that Fantasy Flight Games RPG book style artwork which is a real shame as GW proper used to have quite a staple of artists putting out great art. Adrians black and whites and later the Kopinsky brothers works always made me take notice. It seems they're having trouble making the change into full colour. It also seems that the fact that a piece has colur is considered more important than said pieces quality, which to me is really wierd. That said, some of the illustrators FFG uses are really good - why not use them instead? Yeah it is certainly a big letdown to see so few new images; the artwork was the primary reason I would get their books. The color profile illustrations for the different ork clans in the new book are aweful, completely stripping anything neat out of the orks. Easily covered up with some shoulder pads though. I certainly have to agree with you, although I do like the simplistic Freebooter concept on pg. 23 (probably because of the Power Hook and the purple shading!). It's a shame newer generations of hobbyists will not see the joys that is a Bonner or Smith illustration. Heck, even more recent Imperial Armour illustrations like Mek Boss Buzzgob as you showed are brilliant pieces of inspiration, riddled with details and character - a modeller and painter's dream! Overall I'm quite enjoying the codex, the background parts are a nice read with a mix of old and new material. The best part of the 'dex to me the new layout for the units - each gets a page and all the special equipment and wargear are organised at the back of the book. However, it's a shame about all the datasheets having boring photos of miniatures instead of art, and GW removing most of the options that they don't sell miniatures for. An example, why they don't allow Mek Gunz to be mounted on vehicles I don't know - think of the new overpriced Mek Gunz kit that could of been sold purely for conversions! The lack of art on the dataslates in particular bug me. The pics of the miniatures are everywhere - in White Dwarf, on the website, Warhammer Visions etc.etc. That´s really where you want to have illustrations to make the units come to life. A nice post, Jeff, I seem to find the same things appealing about Orks as you do. 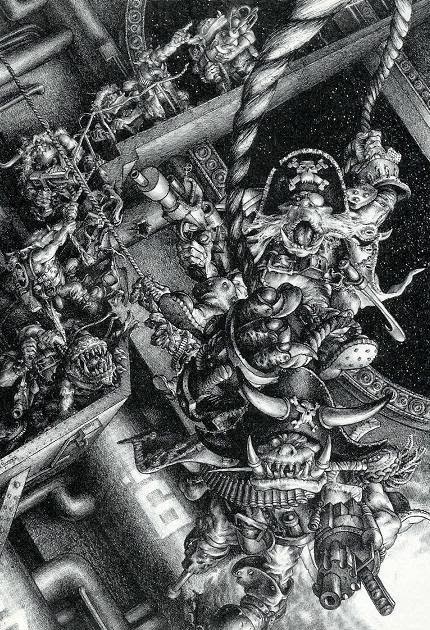 Although my entry into the "Games Workshop Hobby" postdates the Rogue Trader days, my love of Orks didnt really ignite until I read through a friend's Rogue Trader Ork books. The art you posted still brings a smile to my face. 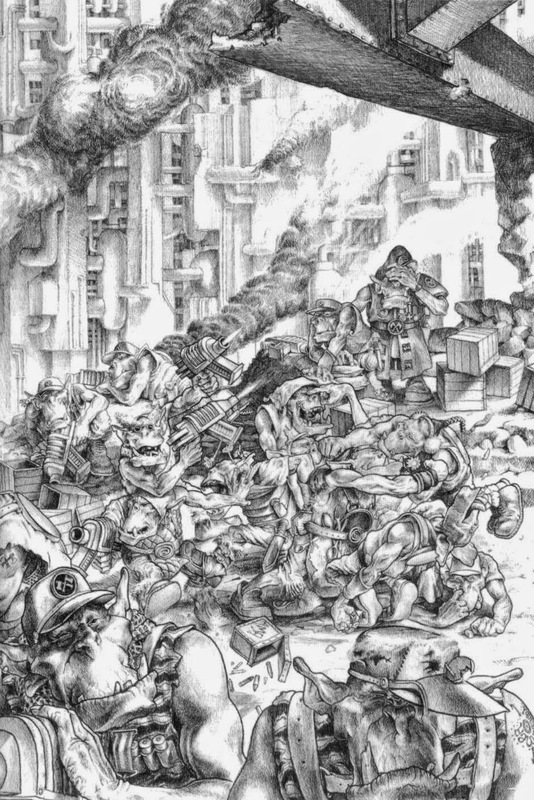 I don't know how to articulate it precisely, but the old art just had a certain vibe, a certain life you can't help but pick up on, whereas the modern Ork art just seems to either fall flat or drowns in visual hyperbole. Yeah it´s hard to pin down, but I think a lot has to do with choice of motif and storytelling. 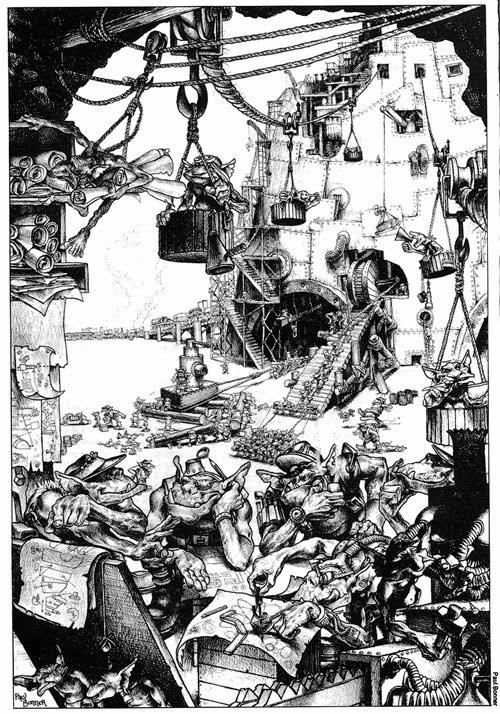 Back in the days a lot of the illustrations said something about the larger world, rather than just being battlescenes. Awesome post, sir! 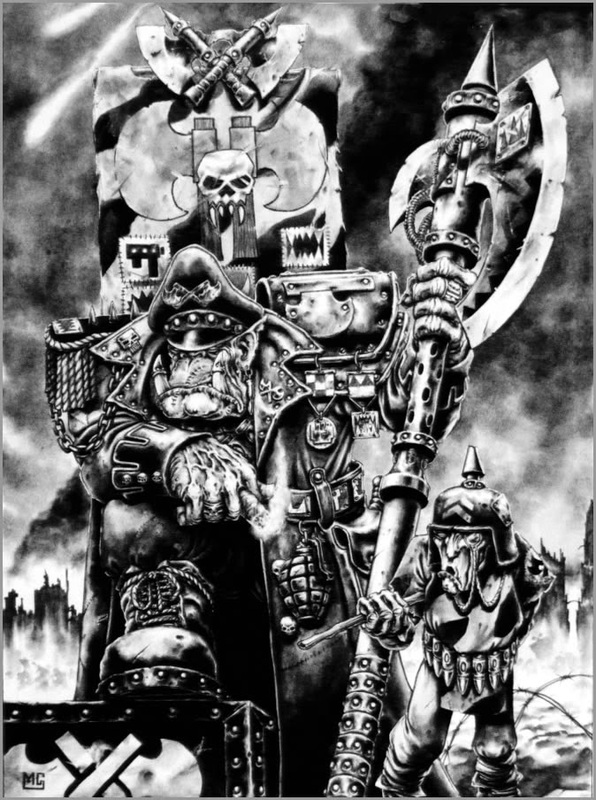 It's exactly that kind of artwork that got me into the hobby all those years ago. I really miss all that wonderful art. It has so much character, weirdness, and humor... all lacking these days. I don't think it's the artists that are too blame or less capable, but the general art direction. I miss the days where miniature boxes had artwork that showed me not only the models, but the world(s) they are fighting over as well. John Blanche's Imperial Guard box cover is my all time favourite of those. 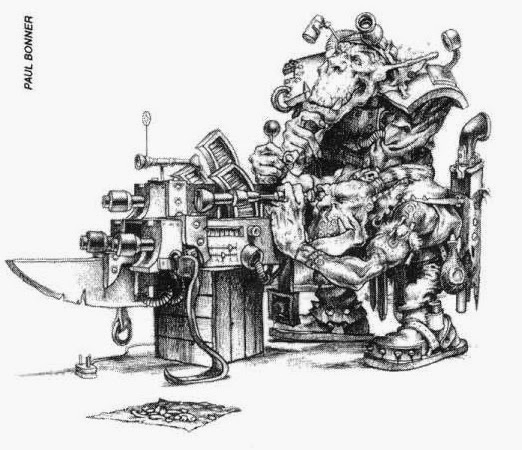 White Dwarf used to be filled with all this amazing art like the above. These days there's hardly a trace of it to be found outside the books. What happened? Art direction certainly has a part. 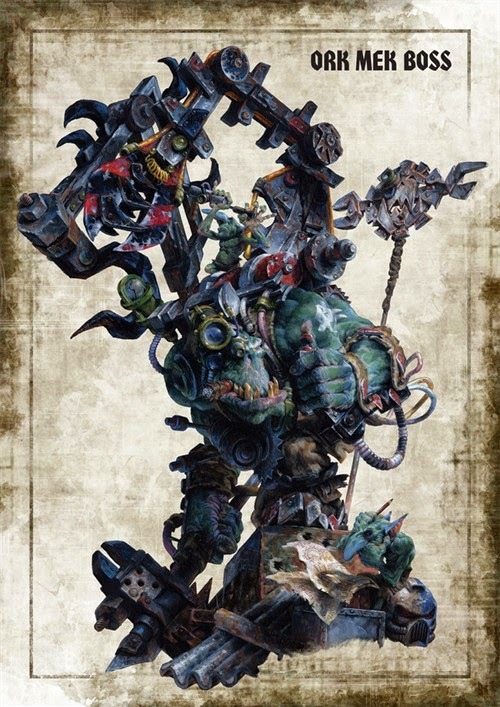 Especially since part of art direction is to choose the right artist in the first place... Orks are notoriously hard to pull off so getting a illustrator who can do that really is the first step. Added two of his best though - thank for reminding me!